I came back from the Venice Biennale preview a few days ago and I’ve been feeling different ever since. All the art I’ve seen has been giving me extremely vivid dreams and I feel like I’ve gained a superpower, which is to store lots and lots of beauty and let it be quietly within me. I feel happy and privileged and have majorly boosted my belief that art possesses an unequaled power of transformation and revelation. This is not a Biennale review, but a collection of impressions and thoughts that I believe have made me a richer person. It also comes from someone who has never been to the Biennale before, so might contain details which veterans will find superfluous. But if you plan to go and want some starting points, here is my version of this wonderful, wonderful event. It makes a very big difference to be there for the preview. This is already useless information for 2015 but should be considered for future editions: there is a strong general feeling that all else pales in comparison to the atmosphere in Venice during the Biennale preview. 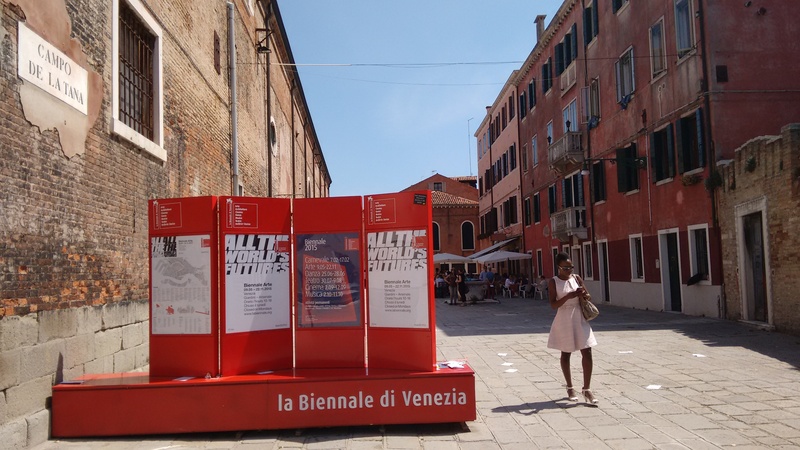 Take each and every piece of art that is in Venice during the Biennale and move the whole thing to anywhere else in the world, and it won’t have half the impact it has right where it is. The magic of the palazzos, the unchanged urban infrastructure, the rhythms of the city and the constant joy of encountering yet another unexpected gem could not be equaled in any other location. 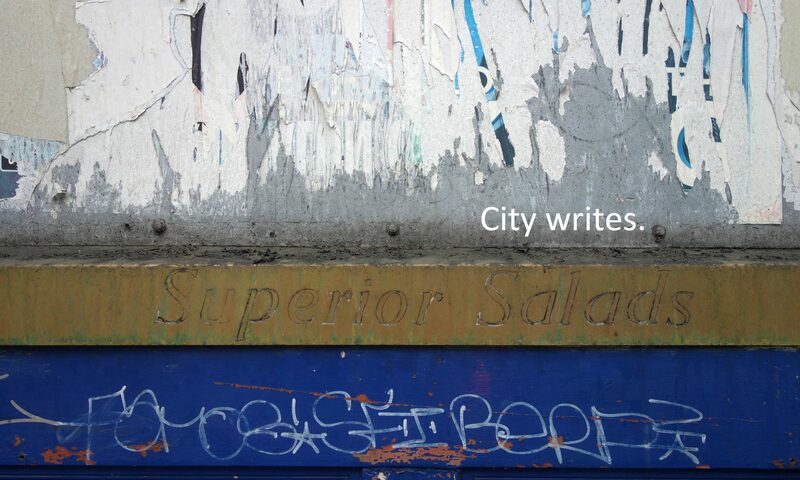 Nor could all the Spritzes, lunches and dinners that make all the walking and art viewing possible. What brilliance to see so few white cube spaces and realise how much this impacts on how one perceives contemporary artworks – not only because of site responsive works, some of impressive scales, but also because of the visual and spatial relations that get created between the opulent palazzos and the art that is of the present. This can blow one’s mind in many different ways. The Giardini and Arsenale have so much work, that the only way you can realistically see and experience everything is to allow for two days each (I did it in one day each). This probably still wouldn’t allow you to see most of the video work, but I would dare anyone to actually sit down and watch all the moving image that is available throughout the exhibitions! Conclusion: video art = bad idea in a show of such breadth, with very very few exceptions (one of which detailed below). Do not make the mistake of thinking that Giardini and Arsenale are the main Biennale venues, they are merely the biggest, most densely-packed ones. All the exhibitions scattered throughout the city are equally important to see and for most people who will have a limited amount of time to spend in Venice, choosing these is a bit of a lottery – albeit a potentially well-informed one. I feel reluctant to write about my favourites and I strongly feel that this story would have been completely different had I written it two days ago, or if I write it again next week. In a way the equation is simple, the best = the most memorable for each of us, but it is hard not to let political or national affinities guide one’s preferences, apart from the obvious personal taste in art. The Biennale is very good for educating and clarifying taste, as you readjust your attention spans according to the most unexpected criteria, learn how to look and expand your standards, and accumulate sights, textures, ideas, information, impressions. Everyone should have the experience of being exposed to art in this wonderful way. 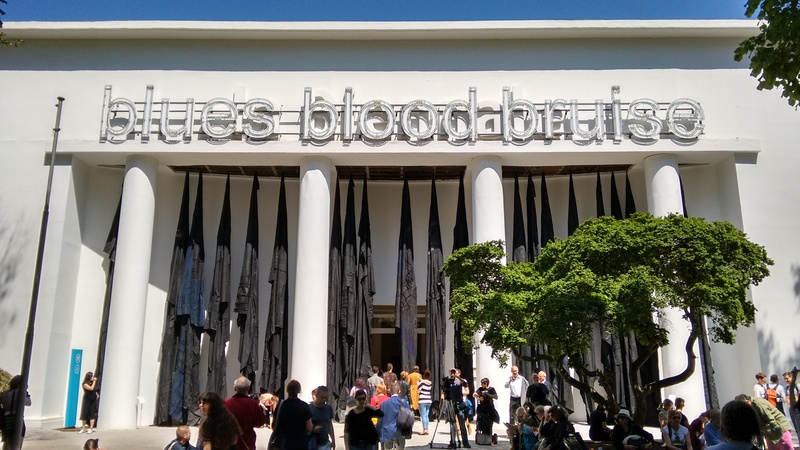 Reluctance aside, perhaps my stronger affinities were with the two national pavilions that showed liquid-based installations, Switzerland and Tuvalu. I found these tranquil and well-paced, immersive enough to entice the senses as well as the mind, and I have very clear memories of the smell and feel of the environments. I must have spent at least 30mins in the Tuvalu pavilion, in two separate sessions, and I wish I had gone back to the Swiss one for a revisit. I am very proud of the Romanian pavilion for showing Adrian Ghenie’s painting and nothing else. After seeing so many national pavilions and collateral exhibitions fail because of too loose curatorial concepts (many overkills, excessive accumulations, failed juxtapositions of too many artists etc), Romania’s was one to stand out through clarity of concept and outstanding painting works. As much of a Ghenie fan as I was, this exhibition has not only made me an even bigger fan, but also a proud Romanian. And what courage to just show painting in a world of installations, videos and other objects – I believe there is consensus about the sharpness of this choice. Other wins: the Japanese key installation, the Korean videos, some of Italy’s (excessive) representation, the massive Chinese outdoor dragon sculptures, the blue sand in the Kosovo room, the British representation with Sarah Lucas, the different Russian environments and the uncanny sculpture, as well as the architectural and sound installations at the Nordic Pavilion. Oh and I also liked the Joana Vasconcelos installation in the watchmaker-sponsored Biennale pavilion. Fails: all overloaded pavilions that lacked a tight curatorial concept (sadly too many to name), Austria (where it took me a while to understand whether there was anything there or not, and what exactly that was), Germany (needlessly convoluted use of space) and Australia (felt like a visit to the natural history museum). Off-site favourites: installation by Liu Ruo Wang as part of the San Marino – China Friendship Project, with a pack of sculpted wolves that can give you nightmares; gorgeous minimalist, patterned Korean painting Dansaekhwa that felt like a breath of fresh air; clean and tight Danh Vo-curated Slip of the Tongue at Palazzo Grassi, despite not being enthused by most work in the show; and a decent amount of work in the Personal Structures exhibitions, especially the ones at Palazzo Bembo. Regarding exhibitions not on this list, readers should assume I haven’t seen them and not judge the list by its exclusions. There was an official collateral event called The Bridges of Graffiti, whose highlight by far was the fabulous life size video installation of a running painted train. There were also other well composed works but overall the show seemed too thin, like there was not enough work put into it, or the work hadn’t been properly finished. A nice surprise during our visit was running into Futura and taking a photo with him. A special nod goes to Aussie crew of Black Art Projects and artist Reko Rennie’s Regalia piece in the courtyard of Palazzo Mora – our conversations, shared visits, spritzes and meals have made the whole experience even more rewarding. I will close with my absolute favourite thing at the Biennale, which is the video piece I was referring to earlier on, 001 Inverso Mundus by Russian collective AES+F. This is one of the best things I have seen in my life. An epic, mind-blowing video installation of gigantic scale and sublime grace, whose conceptual scope and exquisite execution almost had me in tears and gave me an overall personal upgrade. You can read about it here, or buy a ticket and go to Venice until late November to see it and gain your own superpower, there is nothing quite like being there.